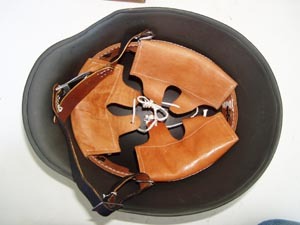 This helmet has been restored to look like an early 1920s Reichsheer helmet. The Wappenschild or providence shield is that of Hesse/Thüringen. 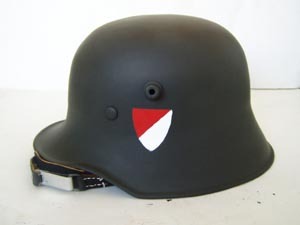 This helmet has several features unique to 1920s era German helmets, including a surplus WWI M16 liner, re-worked with M18 chinstrap bail, and a blackened M18 chinstrap. The helmet has been painted a light shade of field gray unique to Reichsheer helmets.